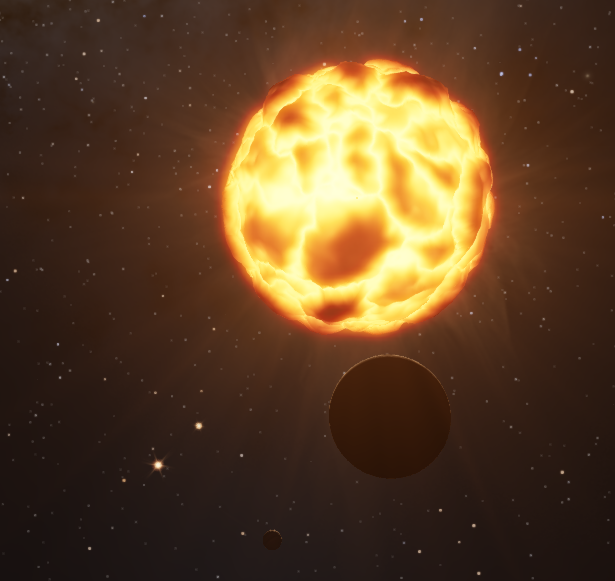 Today I found an extremely bizarre planet around the orange giant star Aldebaran. 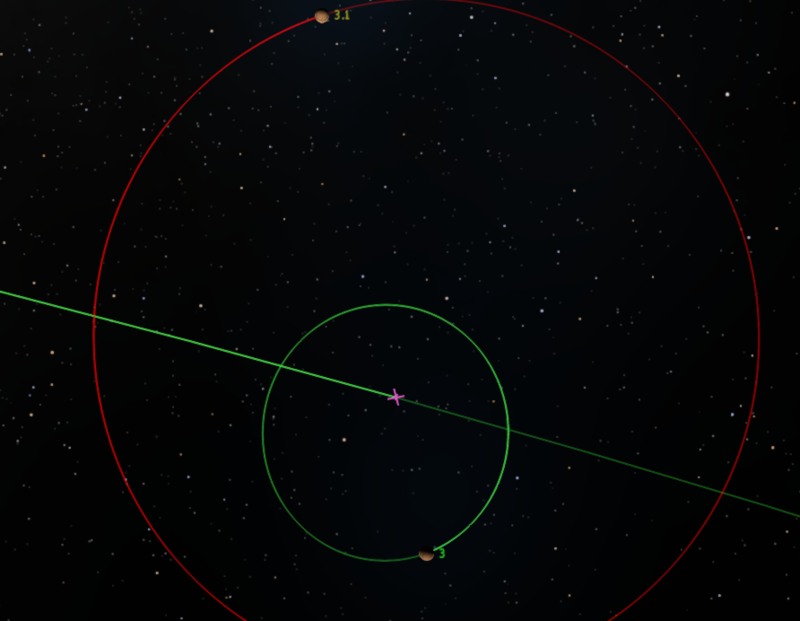 The planet is a gas giant of about 149478 km in diameter... With ANOTHER even bigger gas giant orbiting it. What's more, is, the two gas giants look extremely simmiliar to each other. It's the first time ever I see a gas giant orbiting a gas giant. I honestly didn't even knew such things were possibly, especially since the satellite gas giant is bigger than the gas giant itself. When going to these gas giants, your computer (like mine) will probably work VERY slow, with an average FPS of around 5.00 for me. They also seem to be orbiting the giant star quite close. These screenshots were very difficult to take because Space Engine nearly crashed near this planet. When going to these gas giants, your computer (like mine) will probably work VERY slow, with an average FPS of around 5.00 for me. This is because both the main planet and the moon are evaporating. Gas/ion trails slow down the game a lot. Do you think Gas Giants orbiting each other are possible, even when the sattelite is bigger than the planet itself? The larger giant is considered a moon because its total mass is less than the other giant (so it's less dense). It's probably possible, albeit unlikely, to have gas giants orbit each other. 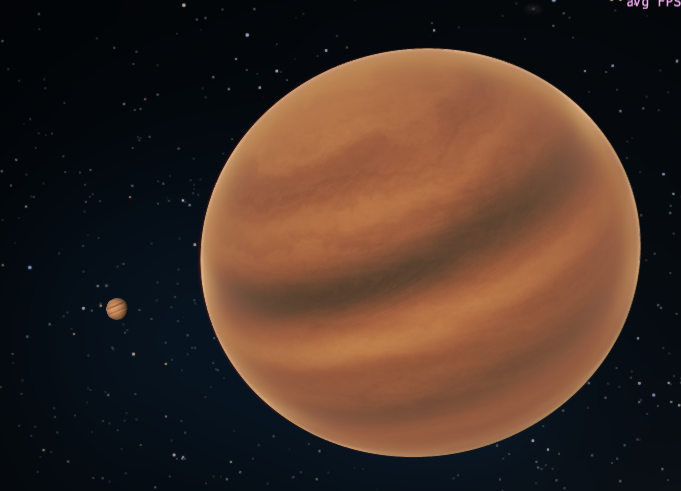 How would a double gas giant form, anyway? Could it have involved an off-center impact of the two? And what exactly would happen in such an impact? How would a double gas giant form, anyway? The same way as close double stars form? Most stars are just gas giants anyway, that got big enough for fusion to happen. Keep in mind that planets do not form in the same way as stars; planets form in a disk of material orbiting a nascent star, so a different physical environment and orbital effects are at work, which complicates the process. My problem with the accretion disc theory is that this requires three gas giants of comparable mass to place two in a stable orbit around the star. Such gas giants shouldn't be able to form in similar orbits meaning that two other gas giants formed elsewhere and were perturbed significantly such that they encountered the first at just about the same time. This sort of thing should be exceedingly rare, much rarer than the ~1/50 chance of double gas giants I've observed in SE. -disk instability model, where a region of the nebular disk becomes overly-dense and collapses to form a giant pretty much all at once. This model might be consistent with formation of binary gas giants; as they would be the result of excess angular momentum from the collapse, much like the formation of binary stars. How definite is the boundary between gas giants, brown dwarfs and stars? There are things like WISE 1828+2650, single or binary. Since they're hard to spot, they could be many in different combinations of mass, composition and spectral class. Solar system formation is chaos in work. I think one regular outcome of that is the unexpected and things difficult to explain sometimes. Currently, the International Astronomical Union considers an object with a mass above the limiting mass for thermonuclear fusion of deuterium (currently calculated to be 13 Jupiter masses for objects of solar metallicity) to be a brown dwarf, whereas an object under that mass (and orbiting a star or stellar remnant) is considered a planet. So above 13 Jupiter masses is a brown dwarf. They must also be below 75-80 Jupiter masses because at that mass they begin fusing 1H. However, for some years now there has been debate concerning what criterion to use for defining the separation between a very-low-mass brown dwarf and a giant planet (~13 Jupiter masses). One school of thought is based on formation, and another on interior physics. Yes, the 13 Jupiter mass limit is what I learned when I studied Astronomy 101 twenty years ago, but newer discoveries seem to challenge that as a meaningful definition. But my point really was that if we stick to such a limit, the formation of a 12.9 Jupiter mass object and a 13.1 Jupiter mass object need not be very different. I think that a binary gas giant can be formed by a terrestrial impact before the giants gain enough time to gather their atmosphere, making both a planet and a moon large enough in a dense enough accretion disk to make both of them gas giants while somehow keeping their gravitational force even enough for a stable orbit. They don't necessarily have to grab each other when they're fully formed. But that can easily work too.